Jieun Lee holds a PhD in Theatre and Performance Studies and a Graduate Certificate in Women’s Studies from the University of Georgia (UGA). She also holds a Master in Theatre from Hunter College, the City University of New York, and a Bachelor of Arts in Korean and English Literature and Language from Duksung Women’s University in Seoul, South Korea. Jieun has published articles and reviews in Theatre Journal, Ecumenica, Journal of Japanese and Korean Cinema, and Puppetry International. A section from her dissertation was published in Theatre Annual: a Journal of Theatre and Performance of the Americas as an article entitled “Performing Transnational Adoption: Korean American Women Adoptees’ Autobiographical Solo Performance.” She is currently working on her book manuscript about the representations of Korean overseas adoptees’ birth searches and reunions in South Korea, the United States, and Scandinavia. Jieun has received numerous distinctions including UGA’s Dissertation Completion Award, the Interdisciplinary and Innovative Research Grant, the Willson Center Graduate Research Award, the Janelle Padgett Knight Graduate Award, as well as the Korean Student Association Research Award and a Korean American Scholarship Foundation Award. adoptees in Asian American performance (with a focus on Korean American performance); and performing race, class, gender, and sexuality in contemporary Korea/East Asia. 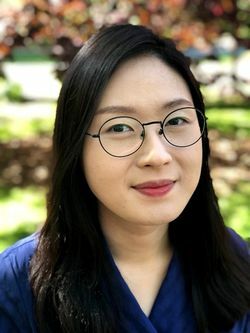 Jieun has taught Women’s Studies at UGA and is presently thrilled to be part of the wonderful community of scholars and students at Wake Forest University.